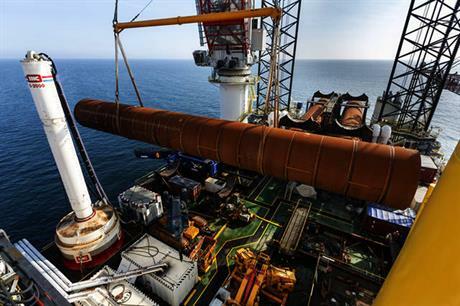 GERMANY: Vattenfall has started the installation of turbines at its DanTysk project in the German North Sea. The company said that first of the 80 turbines has had its tower and nacelle put in place, eleven months to the day since it installed the first of the foundations on the project. Dense fog had held up the installation for more than a day, the developer said, preventing the vessels from getting close enough to start construction. The blades are due to be attatched imminently. Installation of the turbines is being undertaken by Squire Blue Ocean's Pacific Osprey jack-up vehicle. The project which is situated roughly 70 kilometres to the west of the German island of Sylt is due to come online in 2014. Vattenfall announced in December that all of the foundations for the Siemens 3.6MW turbines had been installed. Van Oord started laying the array cables for the project in July 2013, while VSMC was contracted in February to complete the work from April.